Whoah, it's Friday the 13th! Let's have a party. 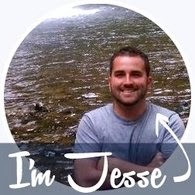 Today's party time is also a Pinterest pick, that's a lot of P's! I've posted before about DIY paper decorations, and after I came so close to making them for fourth of July, I am officially adding paper chains to that list. Paper chains, I'm sure you remember those! 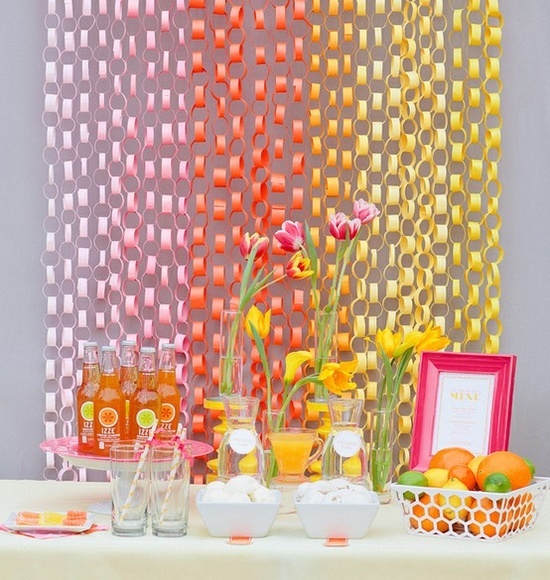 The picture above is not just paper chains but ombre paper chains. What a winning combo. 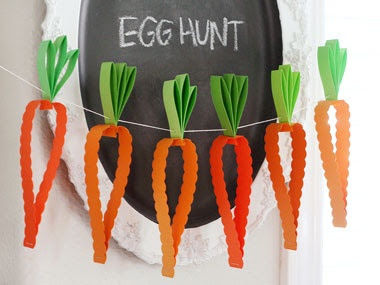 I've always had a thing for these simple decorations, they are easy to make and look awesome. I admit, there was a time I wouldn't dare decorate a party with these chains. It was the teenage years, and could you blame me? In elementary school they had us make tons of those for every holiday, or so it seemed. Maybe the teacher just needed to keep us busy, who knows! So after 6 or so years of these things everywhere I looked there was no way they'd make an appearance at my party. No.Way. Luckily I'm not a teenager anymore and I can get back to adoring and appreciating these awesome chains. 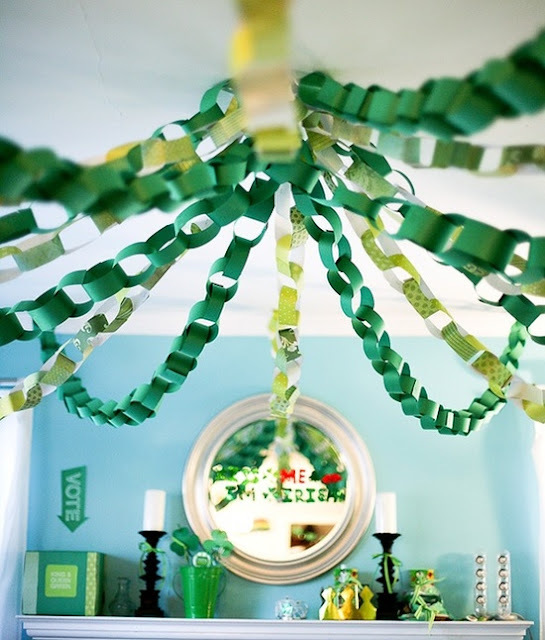 Plus, thanks to the magical internet, we can share all these creative ideas & uses for paper chains with each other. Just like I'm doing today. Do you like green? Yea, those are carrots. Carrots! I couldn't have come up with that. I don't necessarily throw big Easter parties, but now that I've said that out loud, I'm sure the day will come when I am nominated to host some sort of Spring fling. Now I'm prepared. See, so just keeping around a pair of scissors, a stapler + a million staples, and some fun paper will always leave you prepared for the last minute decorations. They don't take long either, just pop a movie in and by the time it's over you'll be swimming in these. My only warning is to put your cats to bed early, they can't resist tearing these apart. Alright ladies & gents, there's just a few more reasons why every party, no matter how big or small, should be all decor'd up. It's not hard, practically free, and will make you fabulous. It's fun, everyone will remember them from childhood, and you can customize them to get the exact look you want. 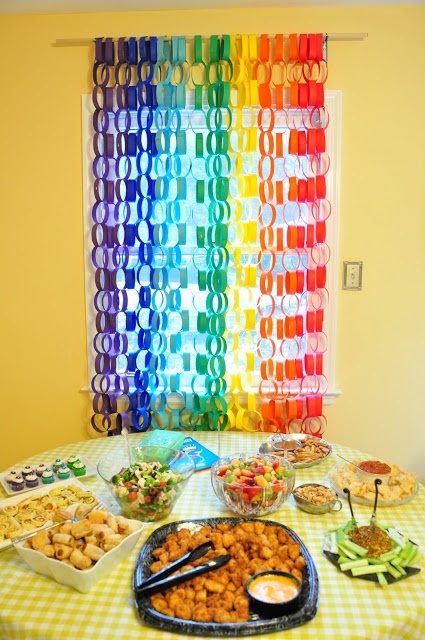 For more party ideas, see my Party Time posts and my Party Time board on the ol' Pinterest. While you're at it, browse around my Pinterest Picks posts too, they're kinda fun. Have a good Friday the 13th and a good weekend, it's Party Time! Oh those carrots are really cute!! Great ideas! 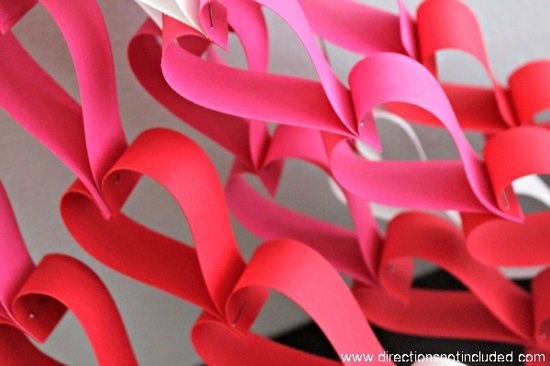 These paper chains look adorable. Want to have them for my birthday party that will be arrange at one of Los Angeles venues. Have planned to do décor all by myself. These chains will look best there. Thanks for sharing this amazing idea.